From meeting with students during Dr Pepper Hour, to traveling around the country to engage alumni in planning Baylor's course over the next decade, to working to reach the $100 million goal of the President's Scholarship Initiative, Baylor President Ken Starr has plenty to keep him busy. Yet, he also still finds time to remain active in the legal community as well. This summer, he and another former U.S. Solicitor General presented oral arguments before the United States Fifth Circuit Court of Appeals in what's become known as the "candy cane case." Formally Morgan v. Plano Independent School District, the case could determine whether children have First Amendment rights under the U.S. Constitution. The case involves several students who were prevented by school officials from sharing religious messages with classmates: an eight-year-old who wanted to hand out candy cane pens with the engraving, "Jesus is the Reason for the Season," a young girl who was threatened for giving away tickets at school to a religious play, a boy who wanted to pass out pencils that had the name "Jesus" on them, and a class of children that was prevented from writing "Merry Christmas" on holiday cards sent to troops overseas. Eight groups of varying political views, from conservative groups to the ACLU, have filed briefs in support of the students. "This is 'cold on the docks' unconstitutional," argued Starr. "We come in the spirit of Barnette v. West Virginia, that school districts have the responsibility to obey the law." The court is not expected to rule on the case until this fall. 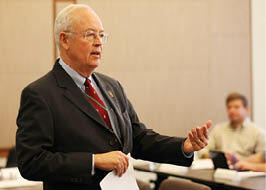 But regardless of the outcome, it speaks well of Judge Starr (and by extension, Baylor) to see the university president active professionally at such a level.